In the Tree Streets neighborhood of Bangor, ME, rodent control services have been very busy. The residents have been having an unusual problem during the summer of 2018: squirrels. Squirrels absolutely everywhere. A squirrel infestation may not be such a huge deal when they stay out in the trees. 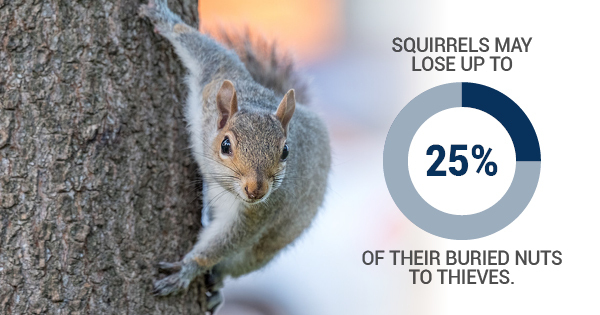 Unfortunately, squirrels can occasionally find their way into homes and cause some damage. The likelihood of squirrels seeking to nest in homes rises when there is a population that wants to spread out. Squirrels don’t mind being around other squirrels terribly, but they are protective of their food and nests. Squirrels may lose up to 25% of their buried food to thieves who get a whiff of it. Because of this, they practice something called “deceptive caching,” where they pretend to bury food to trick potential nut thieves. One Tree Streets resident, Bob Kelly, owns two pieces of property nearby and has said that both buildings have had issues with squirrel infestations this summer. They may find holes to venture into, or chew an entrance into a building themselves. Unwanted rodents are an issue in general, but squirrels are especially large and alarming to have in your walls and attic. Kelly has gotten so frustrated that’s he’s threatened to take squirrel removal into his own hands. There are at least three other recent instances of significant destruction from a squirrel in Maine. In August 2018, several traffic lights in Brewer and 3,000 customers lost power when a squirrel caused damage at a local power station. In May, 3,500 Penobscot County electric customers lost power from another wire-chewing squirrel. An electrical fire that destroyed a Dedham woodworking shop in 2013 was blamed on wires chewed by squirrels. In a nutshell, squirrels don’t only nibble on nuts. Typically squirrel populations don’t fluctuate drastically summer to summer, but when they do it’s not unusual for a particular neighborhood to get the brunt of it. Reasons for a squirrel explosion include a larger number of squirrel families who survived the winter, bigger than average litters, more food supplies than unusual, or even a change in weather. Bangor residents report that it’s been a hotter, drier summer than previous years, though it’s unclear whether this is the cause for the explosion in the local population. Luckily, humane and live squirrel removal are viable options for the residents of Tree Streets until the population hopefully calms down over the colder months.